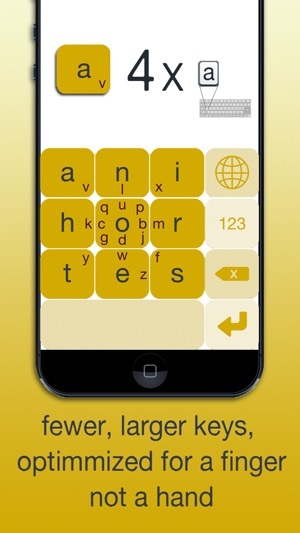 MessagEase is an alternative, non-QWERTY keyboard for your iPhone and iPad. Created based on years of scientific research in user interface, MessagEase is designed and optimized for use on a touchscreen device. 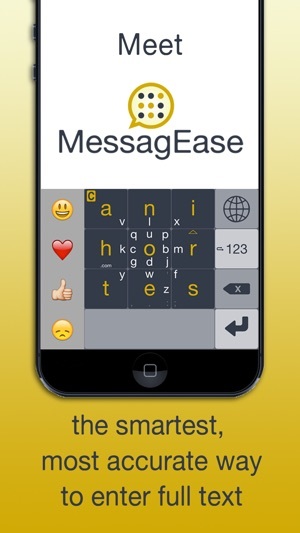 MessagEase is a patented, innovative design different from the antiquated QWERTY keyboard. 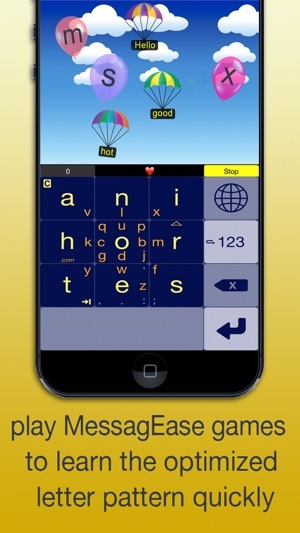 If you believe that every keyboard must be QWERTY-like, then MessagEase is not what you are looking for. But if you are open to new ideas and up for experiencing a completely new way of writing you will be pleasantly surprised at how well, how precisely, and how fast you can enter text with MessagEase. Our current champion’s speed is 87 WPM— that's 87 Words Per Minute! Most people don't type nearly that fast with ten fingers! MessagEase essentially has 9 large keys with an optimized letter assignment to maximize your speed, increase your accuracy, and ease your writing. Since MessagEase is very different, you must spend a few minutes to get used to it. We have included several learning games to help you learn the new, innovative pattern of MessagEase—and you’ll save hours by texting and writing faster. With MessagEase you enter letters and characters with either a tap, or a drag (slide): taps for the most common characters and directional drag for the rest. Please watch the video, or see the section Essential MessagEase, to learn more. 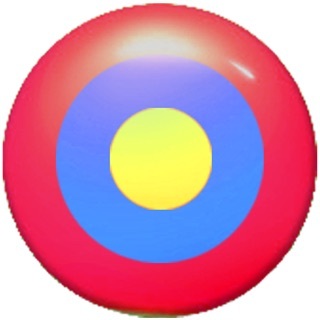 MessagEase's design is based on sound user-interface principles such as the Fitts' Law; it uses letter frequency and di-gram data to optimally place the characters on a keyboard with fewer, larger keys. That’s why the letter positions are non-QWERTY! Please also note that you can change the keyboard size by dragging up or down on the Globe Button. 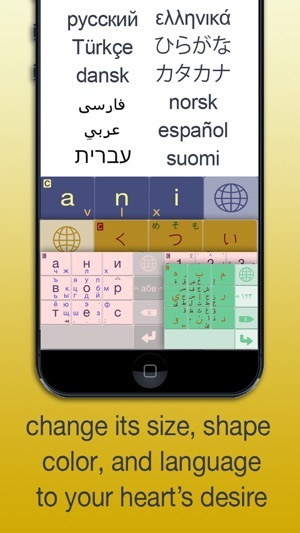 You can also reshape and recolor the keyboard in various ways. See Settings for details. 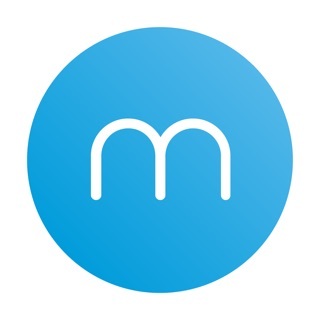 If you like MessagEase, please tell others about it, and please make sure to rate and comment about it on App Store. Please email us if you encounter any issue. Fixed a bug related to tempcap when autocapitalization was disabled. I like how this keyboard can be shrunk and still perfectly usable. Once you adjust to it, you can type just as fast as with a normal keyboard, but you don't have to actually be looking at the keyboard unless you've shrunk it so much that it's tiny. It's also nice to have access to punctuation like quotation marks on the same keyboard as the letters. And it's super useful to retroactively capitolize the first letter of a word. On the other hand, I find that I make more mistakes with this keyboard, which is compounded by the fact it doesn't have autocorrect. The most prevelant one is not roving my thumb down far enough and typing an "e" instead of a space. It's also fairly common for it to read a swipe-to-and-back for a circle and give the wrong capitol letter. And it's more awkward to write at an angle because how your finger moves is just as important as where it lands, and that's more difficult when it's not head on. I do like the customisability. It really helps you choose a color scheme that works for you. I like that I can make a "…" by combining two periods, but I don't understand why I can't make an em-dash busy combining two dashes. Overall, I'd say my biggest issue is the increase in typos, but I do like this keyboard and it's also fun to seem arcane using it. For small screens, this keyboard is fantastic. While autocorrect and word prediction are fairly accurate most of the time, they fall short whenever you are spelling an uncommon word/website name/etc. I was tired of pressing backspace all the time and decided to look for a keyboard that works 100% of the time. The learning curve is about a month for fluency (I am ~55wpm on a phone for both qwerty and messageease), but the payoff is great, especially since we type on our phones so often. Highly recommended. I no longer dread typing on my phone; now it feels as fluid as typing on a regular keyboard! Thank you exideas! Single-thumbed 30+ wpm. Try to reach that on any other phone keyboard. Previously, I would agonize over spelling errors and mis-presses on the default iOS kbd, and had to turn my phone sideways and use two thumbs to make any reasonable speed when typing messages like this one. Once you spend a few days playing the messagease games, itebecomes apparent why the keyboard is so much more efficient.